See Below Who Can Be Hypnotized? In the mid 1970s he began using hypnosis to help friends stop smoking, particularly during pregnancy. The type of hypnosis he practiced at the time did not work on everyone. It did not work because under the old methods of hypnosis he had learned, he “commanded” people to perform posthypnotic suggestion. While some did as he commanded because they really wanted to do so (as explained below) most people do not like to be commanded to do anything! While Dr. La Luz continued to help others with hypnosis he was not satisfied with the limited success of his sessions on some people. After researching and learning much newer methods of helping people to relax and concentrate their thoughts by guiding them through gentle suggestions, Dr. La Luz discovered that almost anyone who wants to be hypnotized and gives permission can be helped by this non-invasive method. 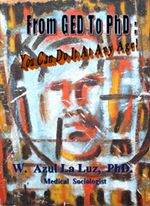 As a matter of a fact, the more intelligent a person, the easier it was for them to let Dr. La Luz help them with whatever it was they sought to change. Serendipitously, in 2006 while studying for a PhD in Medical Sociology at the University of New Mexico in Albuquerque, Dr. La Luz discovered a hypnosis school in Albuquerque. He trained under the expert teaching of Ms. Lois Prince, who had been training hypnotist and practicing hypnosis for many years. As such Dr. La Luz trained in pain management and secured a certification in Clinical Hypnotherapy. He is a certified member of the National Guild of Hypnotist and the International Hypnosis Federation. • Helping clients have an easier time of approaching, undergoing and recovering from medical surgeries. • Helping top level executive and people in high powered professional position learn to relax and reduce their stress levels. He can help you too if you would like him to do so. If you have the ability to lose yourself in a television program or movie, or if you can lose yourself in a daydream, or conversation to the exclusion of your surroundings, or if you have been driving and realize you have driven for miles without seeing the road, you have already experienced what hypnosis is. Hypnosis is the ability to concentrate our thoughts into a tightly focused attention pattern to the exclusion of all other external stimuli. We let our autonomic system take over and we allow our subconscious to emerge directly without interference from anything outside ourselves. Once our attention is so focused, we have the ability to do amazing feats to help ourselves. We can learn how to lessen or feel no pain at all. We can learn how to comfortably lose as much weight as we want, or to stop smoking quickly and permanently. We can study better, read faster, and remember those items which we wish to remember, and much more. We can learn how not to be scared of taking test! Or quell other phobias. I we can often accomplish anything thing we want to, but the important issue there is that we really want to do that which we think we want to do. That is not always the case. Another important issue in hypnoses is that no one can make a hypnotized person do anything that the “relaxed” or hypnotized person does not wish to do. That is a very important point. While under hypnosis the person is completely aware of everything that is said and done around them: they are totally aware.